Oh spring, thou art a fickle season: blazing sunshine one day, blustery winds and sudden cloudbursts the next. It's no wonder we're still reaching for lightweight jackets and scarves even after the winter coats have been dry-cleaned and put away! If you're just starting to build your outerwear wardrobe, these are the core pieces that will work overtime during the warmer months. 1. Gap printed tweed moto jacket ($34.99). Moto jackets have transcended their rebellious roots and become a non-negotiable in urban women's wardrobes, Give your standby leather version a break and slip on a lighter one in textured tweed, pastels, eyelet, or florals. 2. Madewell outbound jacket ($98). As recent outfit posts can attest, I've been wearing my military jacket non-stop on the weekends. Effortless cool and the ideal thickness for low to mid-teen temperatures. 3. Burberry London cotton twill trench ($1,650). A khaki trench is a classic for a reason: it adds polish to casual jeans and pairs perfectly with pencil skirts and dresses for the office. Although lovely versions can be found at places like Banana Republic and Aritzia, the gold standard for trenches remains Burberry. 4. J. Crew schoolboy blazer ($150). Spring's balmy temperatures may tempt you into buying linen, chambray, and blush-silk versions of this staple. All fine and good, but a well-fitting black wool one will prove to be the wardrobe workhorse among them. 5. Lifetime 'Lee' jacket ($160). Rain is an inescapable reality of life in Vancouver, especially in the spring. This is my sort of ideal rain jacket: water-resistant, with a hood and deep pockets for essentials if I just need to run out for coffee. 6. Joe Fresh denim jacket ($39). Counterbalances the femininity of summer dresses with a bit of tomboy. How many of these essential outerwear pieces do you own? Which do you wear most often, and why? Trench coats and blazers are my absolute essentials for Spring! I definitely need to add a moto jacket to the collection though, that tweed one is adorable. It's such a great topper for dressing up a tee and jeans. 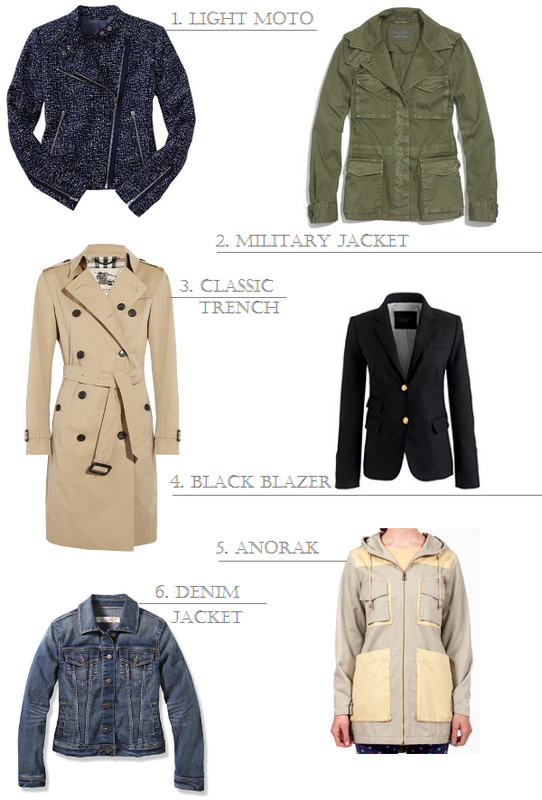 I live in my denim jacket on casual days and trench for work in the spring! Really great essentials guide. Hit the nail on the head perfectly! I love the light motto and military!